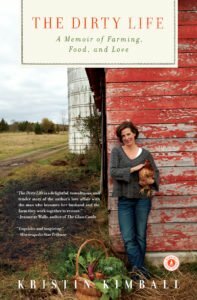 A couple of years ago, we posted a glowing book review of Kristin Kimball’s The Dirty Life: A Memoir of Farming, Food, and Love (Scribner, New York, New York, 2011). Kimball’s memoir is a page-turner that tells a very personal story on how the acres she farms with her husband became their life together and the setting for a continuous struggle to outrun the primordial forces of death and wildness. Quite a literary mouthful, but her well-told story persuades the reader that she is sharing something very deep. With some relief, Essex Farm on Lake Champlain in northern New York State has rewarded the Kimballs’ dirty life. She writes that you give, and then you give some more, and then you give to the point of breaking, and then and only then it gives back so bountifully it overfills not only your root cellar but also that parched and weedy little patch we call the soul. Kimball’s book is also about the food itself that she grows and it’s full of descriptions of delicious meals made with organic ingredients from kale with poached eggs to deer liver with homemade bread. And with her ability to paint with words the farming life and its struggles and triumphs, Kristin Kimball’s weekly blogging about Essex Farm has become a reading pleasure. I like sweet corn any way that a person can dish it up, from raw in the field to charred on a grill. 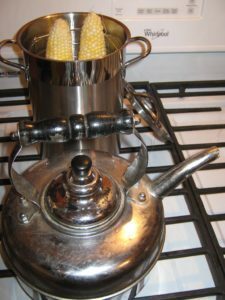 I never boil it, but steam [emphasis added] and always in great quantities, so that there are two categories: the fresh on the cob corn that’s eaten hot with butter and salt; and the next-day corn, which is a different animal entirely. That one, I like best cut off the cob, reheated in a skillet with a little butter, then spritzed with lime (or vinegar), seasoned with salt and pepper, and topped with a giant handful of cilantro, some chopped green onion, diced tomatoes, and maybe some hot peppers, either pickled or fresh. I believe that any way you cook it, sweet corn plus some new potatoes is a meal. If you want to get fancy you can grill some sausages and throw together a green salad, but really the corn and the potatoes are all you need. This time of year, simple is good, and you can’t do any better than letting food speak for itself. 1) Husk the number of ears you want to serve, (2) Boil up a big pot of water and when the water is rapidly boiling, turn off the heat, put in the husked ears of corn and cover the pot; (3) Wait 5 minutes & remove ears; (4) Butter and lightly salt and enjoy. But as an admirer of Kimball’s great knowledge and experience about food and farming, her words that she never boils it, prompted me to rethink my methodology. True, I don’t actually boil the corn, but then again I’m not steaming it either. And I should point out that I’m not wasting the water which I boil up before turning off the heat and adding the ears. Once the water cools down, I’ll use it to water a plant or two and not waste any nutrients that might have been cooked away. This year I’ve been watering citronella plants along the sidewalk leading up to my house (which seem to have prospered as a result). Today’s corn needs only to be warmed through. If you immerse but 2 or 3 ears at a time in a large amount of boiling water, so that the water stays at a boil, a dip of only 30 to 60 seconds is enough to heat the ears. Sweet corn should be firm but tender to the bite. If you want it slightly softer and more cooked, leave the ears in the water for 2 to 3 minutes- but no more. 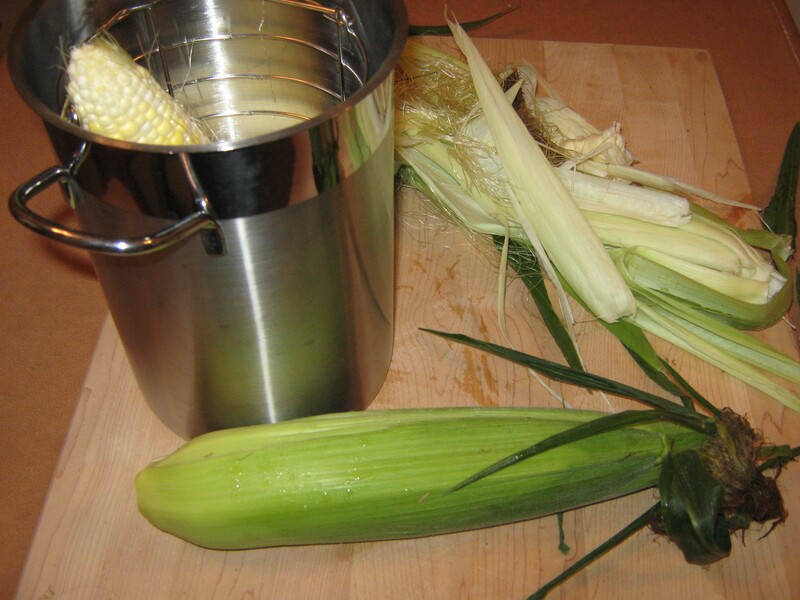 Husk the corn and remove the silks from fresh ears of sweet corn. I use local and organic corn. 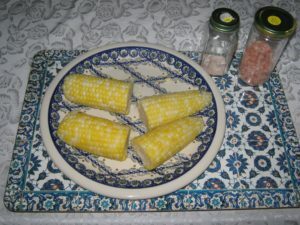 Earlier in the week, I had used my old preparation method described above for the corn received as part of my CSA farm share from Roxbury Farm in Kinderhook (Columbia County), NY. 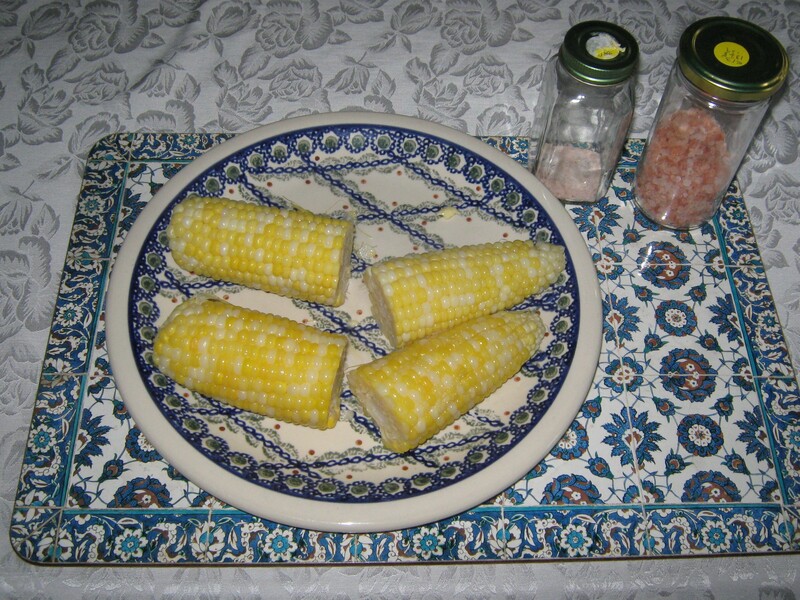 So a visit to the Denison Farm booth at the Troy Farmers Market in Troy (Rensselaer County, NY), across the river from Albany, was the source for the ears of organic and local sweet corn used for this recipe and my new steaming methodology. Using a tea kettle, boil up water and pour into the bottom of an Asparagus (and Corn!) Steamer so that it covers about two inches in the bottom. 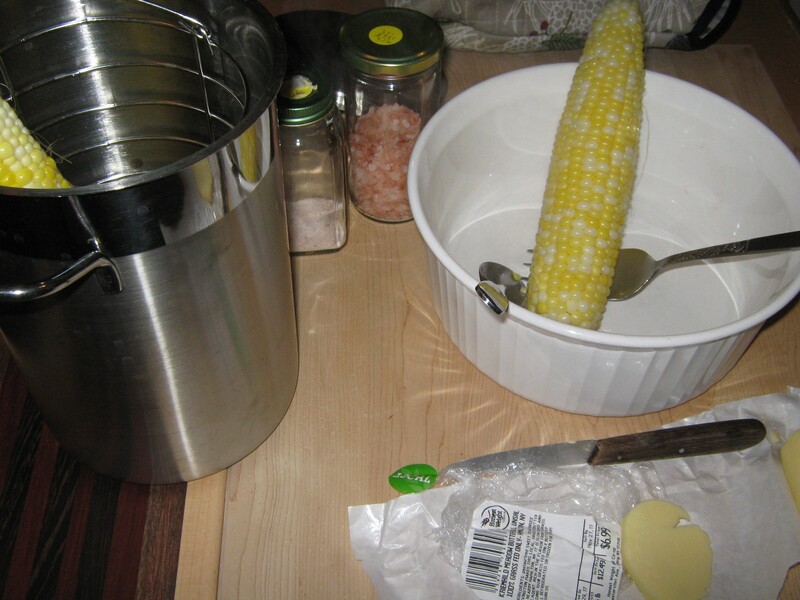 Place two or three ears of corn into the steamer and cover the steamer. Over medium heat steam the corn for 15 minutes. After about 7 or 8 minutes, check to see if the water is starting to boil out, and add more to keep at around 2 inches so water doesn’t evaporate. 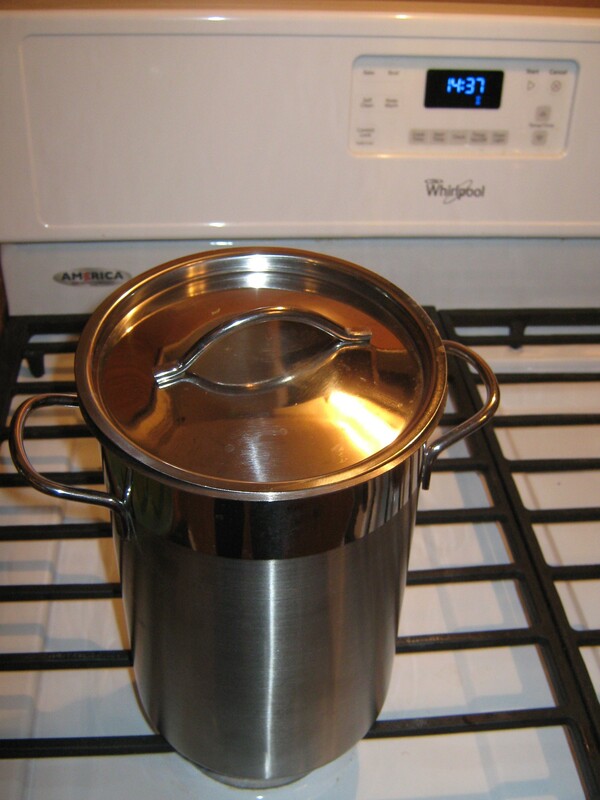 Until the corn has steamed for the full 15 minutes, check a couple additional times to make sure the water hasn’t completely evaporated. Remove corn from the steamer and serve with butter and lightly salt. I use Kriemhild Meadow butter made with milk from the Hamilton (Madison County, NY) dairy farm’s grass-fed cows and a light sprinkling of Himalayan pink sea salt. Sweet and tender, but not soft!